Welcome home Jenny Bruce, Tour Director Extraordinaire since October 2015. She and our tapestry are safely back from the last of its RTW exhibitions in Iceland where, once again, there were surprises to delight us all. Over 1000 visitors came to see the artwork at Laugaborg/ Akureyri and the local embroiderers resolved to design and stitch an extra five diaspora panels that will be included in the next exhibition back in the UK which is at Westminster Hall. In the coming 18 days TLC is being bestowed on the panels in Prestonpans in preparation for Westminster which opens on March 20th @ 1pm and runs [excluding Sundays] until April 29th hosted by the 'Scottish' Crown Court Church in Covent Garden. From March 21st Entrance to the exhibition is best made between 10 am and 4pm [it closes 6pm]. Enter by the Cromwell Green Door just opposite Westminster Underground Station - note there will be airport style security checks at the Hall! 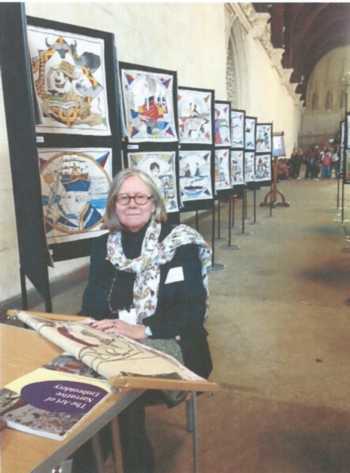 Visitors at Westminster Hall will find stitchers, amongst others Gill Lindsay [see below - who also stitched # 10 Downing Street with its Scottish Prime Ministers] at work creating a fresh panel on the US' Scottish Presidents - of whom the latest is Donald Trump whose mother was from the Hebrides and spoke Gaelic all her life. There will be two special occasions during the exhibition as well as much enjoyment for thousands of visitors. On Thursday March 23rd from 6pm/ 9pm the High Commissioners and Ambassadors of the 35 countries represented have been invited to taste the Glenkinchie and their own national foods as they view the artwork. And later when Parliament reassembles after Easter, all MPs and Peers will be similarly invited.